This lamb lollipop recipe is quick and easy, yet packed with flavour. 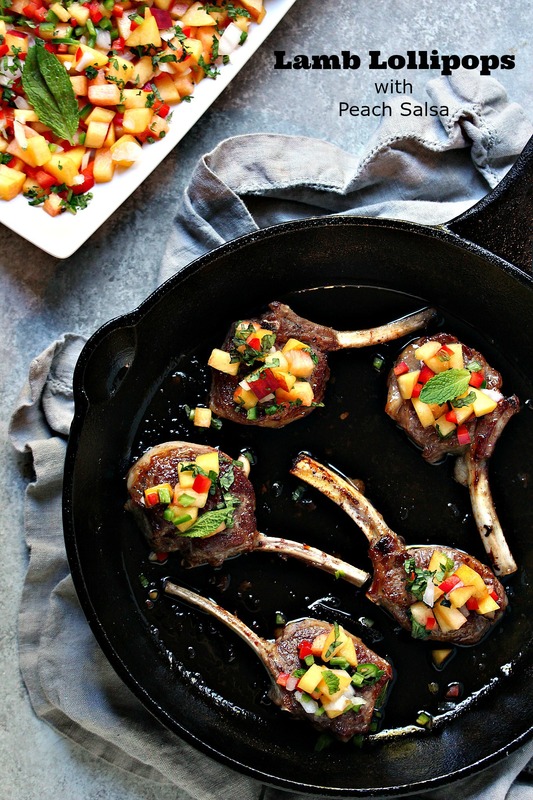 The lamb is seared, then topped with an easy peach salsa recipe. A stunning meal on the table in under 20 minutes. 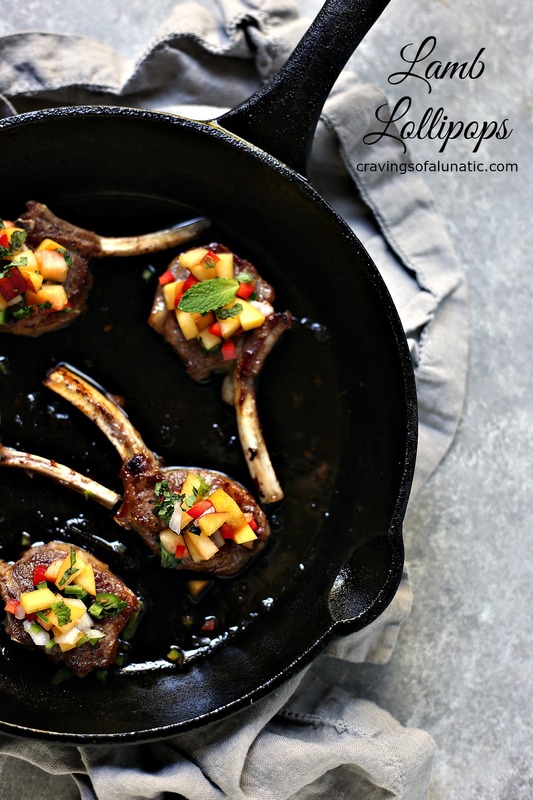 Click here to pin these gorgeous Lamb Lollipops with Peach Salsa! For those who have not heard of lamb lollipops they are essentially a rack of lamb cut into pieces. Each rack of lamb typically has 8 rib bones. 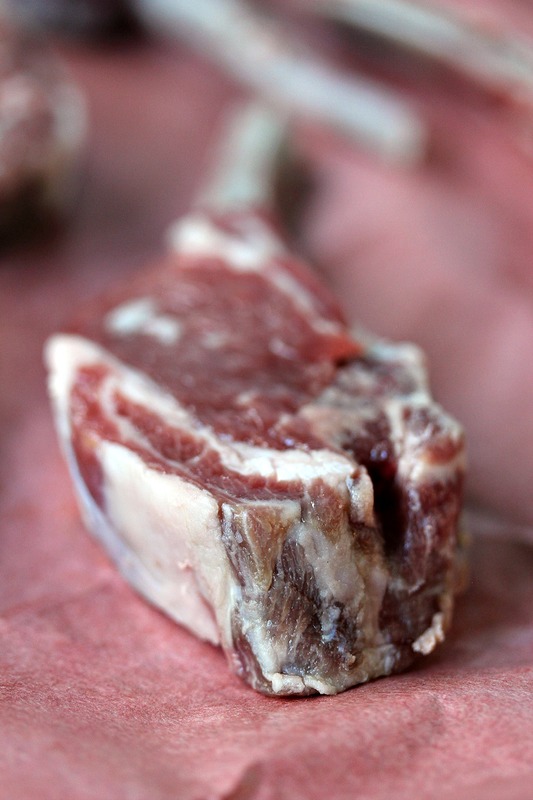 To make lamb lollipops the butcher cuts the rack of lamb into lamb chops, then the chops are french trimmed. This leaves an exposed bone so you can basically pick up your lamb chop and eat like a caveman. Not that I’ve done that. This recipe makes 8 lamb chops, only 5 are in the photo because I used two cast iron pans for this recipe. Apparently I need to go shopping to get a bigger cast iron pan. Pronto. I plan on making another batch of these with a different salsa next week so it would probably be wise for me to order a nice big cast iron pan that can fit all 8 pieces of lamb lollipops. You can pick up lamb lollipops at Loblaws in Canada. We shop there all the time. If you aren’t sure where to locate them ask someone who works there to steer you in the right direction. The staff at Loblaws is incredibly helpful and friendly. It’s part of the reason we love shopping at their stores. Lamb has a delicate flavour, and in my humble opinion should not be over-seasoned. If you’re going to make lamb I truly believe you should keep the recipe simple so you don’t overpower the natural flavour of the meat. 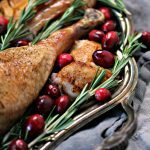 Keep it simple, season gently and cook it as simply as possible. Let the natural flavour stand on its own. For this recipe I pan-seared the lamb lollipops. Another great cooking method for lamb is to grill it. Since most people only grill seasonally I decided to pan-sear this one for you. If you prefer to grill it then simply season it the same way and cook the meat on the grill instead. It’s very simple to swap this recipe to a grilling recipe. I made a simple peach salsa for this recipe. In all honesty I actually planned to make an apricot salsa to accompany this recipe. My hubs had other ideas apparently because when I wrote apricots on the grocery list he came home with dried apricots. It’s okay, I love the guy so I forgave him for this silly indiscretion. This one time. Next week I’ll share my apricot salsa recipe with you, I promise. Now that I’ve mentioned it I’m sure you are all chomping at the bit to get the recipe for it. It’s funny how that works. Once you put something out there like that you have to follow up on it, am I right? So I’ll post the recipe for apricot salsa another day. Pinky swear. I had lots of other fruit on hand so I simply swapped out peaches for the apricots. I usually do lamb kebabs with peaches, so I knew the flavour profile would be bang on. I added some heat to the salsa with some jalapeno peppers. I rounded it out with Vidalia onions and red peppers, plus some gorgeous mint. Flavour perfection, not even kidding. 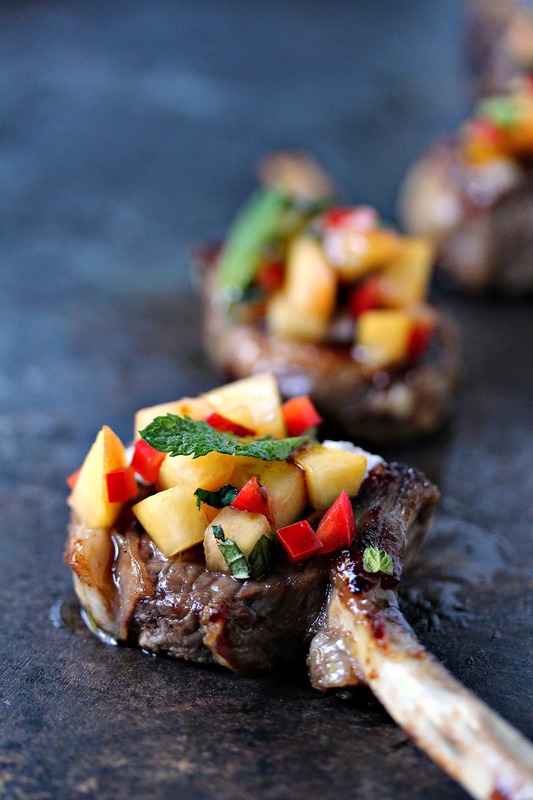 For now let’s make these gorgeous Lamb Lollipops with Peach Salsa. It’s quick, it’s easy, and it’s jammed pack with flavour. This recipe will have every one who tries it begging for more. For fun I’d totally make them arm wrestle for the last couple of lollipops. I mean why should dinner time be boring. Have some fun with it. 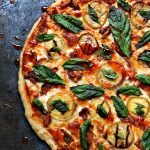 Enter the Loblaws Instagram contest between September 6 – 30! Upload an original picture to your Instagram page that highlights the monthly Food Alert Item, this month is LAMB LOLLIPOPS! Include the campaign hashtag #ShareTheFoodLove! Place a cast iron skillet over medium-high heat, add olive oil. Let it heat up until it glistens. Sprinkle salt, pepper, and garlic over the lamb lollipops, evenly. 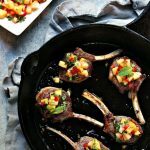 Toss the lamb lollipops in the pan, cook for about 3 to 4 minutes, turn and cook for another 3 to 4 minutes. Vary time according to how you like your meat. Lamb is best when it's not over-cooked, so well done is not optimal for it. Medium is a good choice, but everyone has their own preference. Cook it to your preference. Remove from pan and let rest for about 5 to 10 minutes before serving. Cut up all the ingredients. Mix peaches, sugar, onion, jalapeno pepper, red pepper together. Cut limes in half and squeeze juice over the salsa. If making salsa the night before wait till about 30 to 60 minutes before serving to add the juice. It will break down the salsa if done too early. Add mint right before serving so it doesn't overpower the salsa. If you like to eat you alcohol this salsa is perfection with a hit of tequila in it. Your call. 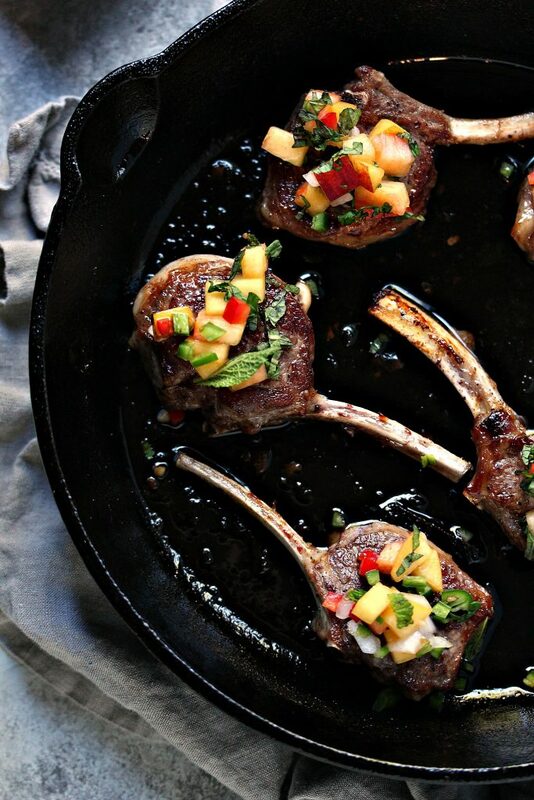 Plate the lamb lollipops, then spoon salsa over each one. Be sure to put extra on the table for those who like a little lamb with their salsa. I tend to go heavy on salsa. You control your own salsa destiny. Serve with a big old I made dinner in under 20 minutes smile! 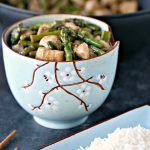 Be sure to check out my recipe index for more great main course recipes. You can also find more great cast iron cooking recipes. I love my cast iron pans. They are great for cooking meat, as well as desserts. I love my cast iron pans as much as I love my cookie sheets. Nothing beats a great sheet pan recipe. While you’re here be sure to follow me on Pinterest. I’m always online pinning great recipes, as well as fabulous DIY ideas, and cute cat photos. Pinterest is a riot. Also, take a minute now to follow me on Instagram. 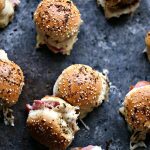 It’s a great way to keep up with all the latest and greatest recipes from the blog. I literally am OBSESSED with lamb! It’s the first thing I ever cooked for my husband! This lollipop idea is so fun and that salsa is bomb! Pinned! What a gorgeous skillet of lamb. I love the vibrant salsa! Woah. These look absolutely perfect!! Great for a dinner party! This should be on the menu at some fancy restaurant! So awesome! I don’t think I’ve ever tried lamb and peaches together, but it sounds delicious and looks beautiful! Oh, Kim, those are gorgeous!! I love lamb, it’s way too under-appreciated here in the U.S.. I think anyone would love what you’ve created here! 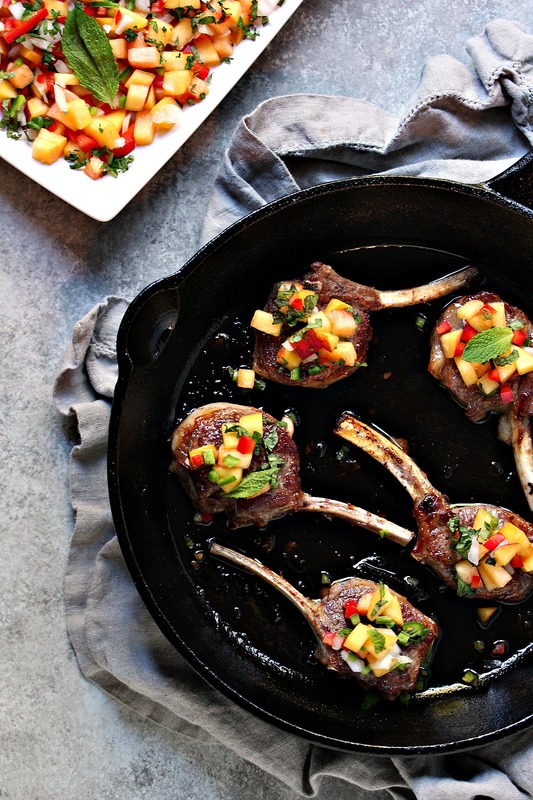 The sear you can get with a cast iron pan is perfect for lamb chops. 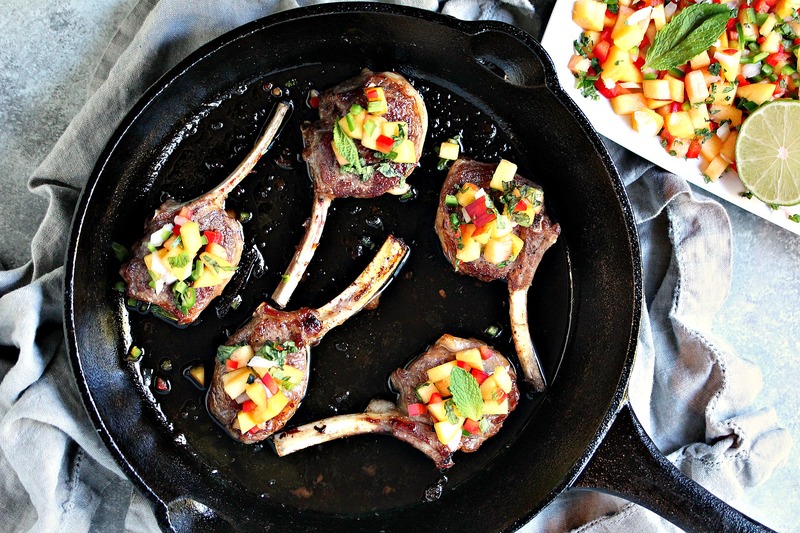 I’m drooling over these chops and would gladly eat them for breakfast…if only I could. Great recipe. Very elegant, yet simple. 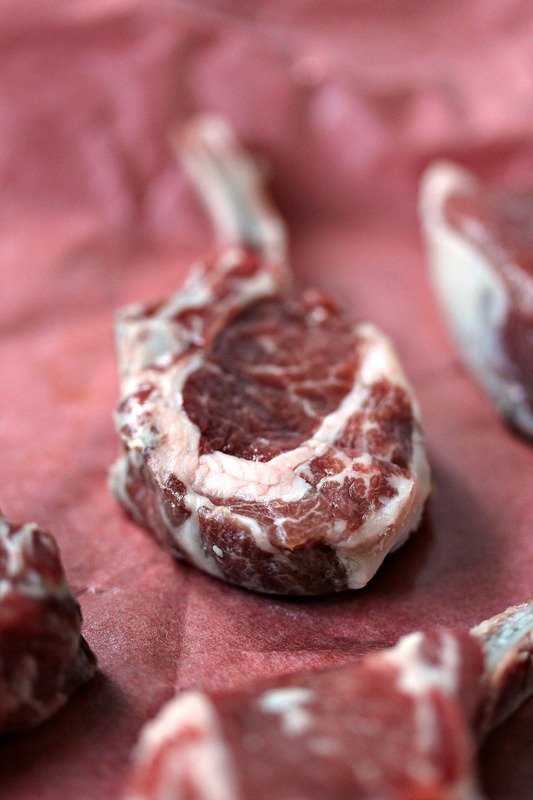 These lamb lollipop are out of this world! 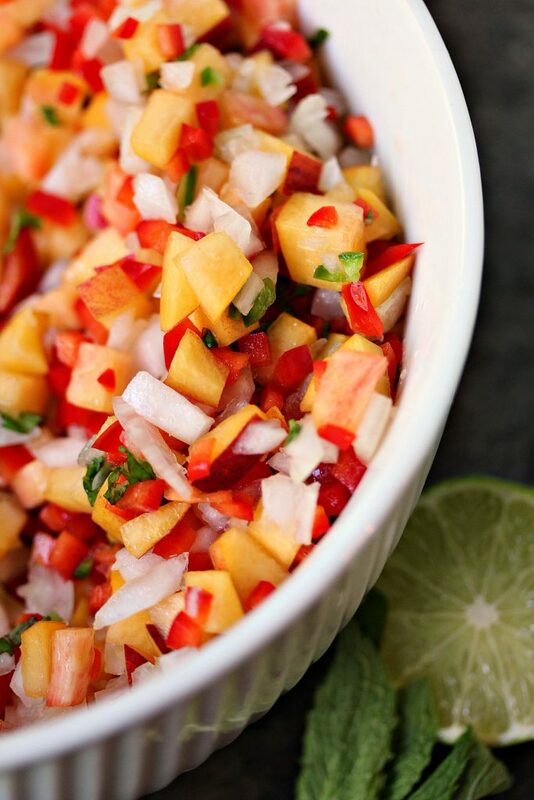 That peach salsa, oh my word, I bet it’s amazing too! I like any kind of lollipop, sweet or savory, but really prefer these to the candy ones. 🙂 Sounds like good stuff — thanks. I can totally see these served at a party, no plates requried! This is so elegant! I love how beautiful these are! 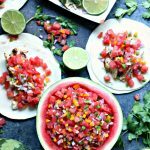 The peach salsa sounds so very good and it such a bright topping! Great presentation! That topping looks fresh! I have recently become absolutely obsessed with lamb. 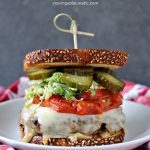 Love the fresh twist with the salsa!